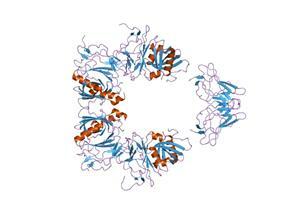 PDB rendering based on 1cmo. 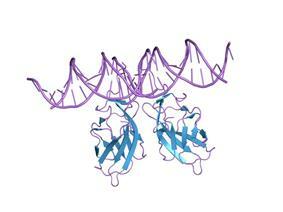 Runt-related transcription factor 3 is a protein that in humans is encoded by the RUNX3 gene. This gene encodes a member of the runt domain-containing family of transcription factors. 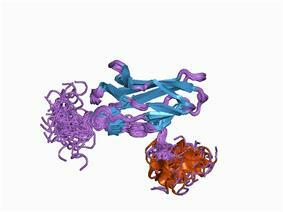 A heterodimer of this protein and a beta subunit forms a complex that binds to the core DNA sequence 5'-YGYGGT-3' found in a number of enhancers and promoters, and can either activate or suppress transcription. It also interacts with other transcription factors. 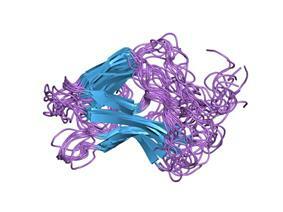 It functions as a tumor suppressor, and the gene is frequently deleted or transcriptionally silenced in cancer. Multiple transcript variants encoding different isoforms have been found for this gene. In melanocytic cells RUNX3 gene expression may be regulated by MITF. Runx3 null mouse gastric mucosa exhibits hyperplasia due to stimulated proliferation and suppressed apoptosis in epithelial cells, and the cells are resistant to TGF-beta stimulation. RUNX3 has been shown to interact with TLE1. ^ Levanon D, Negreanu V, Bernstein Y, Bar-Am I, Avivi L, Groner Y (February 1995). "AML1, AML2, and AML3, the human members of the runt domain gene-family: cDNA structure, expression, and chromosomal localization". Genomics 23 (2): 425–32. ^ Levanon D, Eisenstein M, Groner Y (April 1998). "Site-directed mutagenesis supports a three-dimensional model of the runt domain.". J Mol Biol. 277 (3): 509–12. 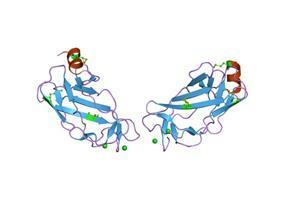 ^ "Entrez Gene: RUNX3 runt-related transcription factor 3". ^ Hoek KS, Schlegel NC, Eichhoff OM, et al. (2008). "Novel MITF targets identified using a two-step DNA microarray strategy". Pigment Cell Melanoma Res. 21 (6): 665–76. ^ Li QL, Ito K, Sakakura C, et al. (April 2002). "Causal relationship between the loss of RUNX3 expression and gastric cancer". Cell 109 (1): 113–24. ^ Levanon, D; Goldstein R E; Bernstein Y; Tang H; Goldenberg D; Stifani S; Paroush Z; Groner Y (Sep 1998). "Transcriptional repression by AML1 and LEF-1 is mediated by the TLE/Groucho corepressors". Vogiatzi P, De Falco G, Claudio PP, Giordano A (2007). 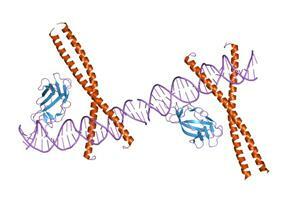 "How does the human RUNX3 gene induce apoptosis in gastric cancer? Latest data, reflections and reactions.". Cancer Biol. Ther. 5 (4): 371–4. Wijmenga C, Speck NA, Dracopoli NC, et al. (1995). "Identification of a new murine runt domain-containing gene, Cbfa3, and localization of the human homolog, CBFA3, to chromosome 1p35-pter.". Genomics 26 (3): 611–4. Bae SC, Takahashi E, Zhang YW, et al. (1995). "Cloning, mapping and expression of PEBP2 alpha C, a third gene encoding the mammalian Runt domain.". Gene 159 (2): 245–8. Bae SC, Yamaguchi-Iwai Y, Ogawa E, et al. (1993). "Isolation of PEBP2 alpha B cDNA representing the mouse homolog of human acute myeloid leukemia gene, AML1.". 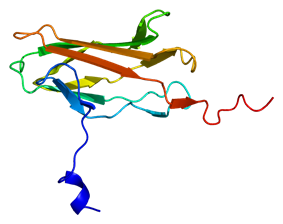 Oncogene 8 (3): 809–14. Levanon D, Goldstein RE, Bernstein Y, et al. (1998). "Transcriptional repression by AML1 and LEF-1 is mediated by the TLE/Groucho corepressors.". Proc. Natl. Acad. Sci. U.S.A. 95 (20): 11590–5. Bangsow C, Rubins N, Glusman G, et al. (2002). "The RUNX3 gene—sequence, structure and regulated expression.". Gene 279 (2): 221–32. Li QL, Ito K, Sakakura C, et al. (2002). "Causal relationship between the loss of RUNX3 expression and gastric cancer.". Cell 109 (1): 113–24. Waki T, Tamura G, Sato M, et al. (2003). "Promoter methylation status of DAP-kinase and RUNX3 genes in neoplastic and non-neoplastic gastric epithelia.". Cancer Sci. 94 (4): 360–4. Puig-Kröger A, Sanchez-Elsner T, Ruiz N, et al. (2004). "RUNX/AML and C/EBP factors regulate CD11a integrin expression in myeloid cells through overlapping regulatory elements.". Blood 102 (9): 3252–61. Kato N, Tamura G, Fukase M, et al. (2003). "Hypermethylation of the RUNX3 gene promoter in testicular yolk sac tumor of infants.". Am. J. Pathol. 163 (2): 387–91. Yang N, Zhang L, Zhang Y, Kazazian HH (2004). "An important role for RUNX3 in human L1 transcription and retrotransposition". 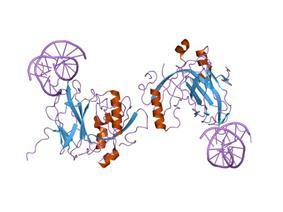 Nucleic Acids Res. 31 (16): 4929–40. Ota T, Suzuki Y, Nishikawa T, et al. (2004). "Complete sequencing and characterization of 21,243 full-length human cDNAs". Nat. Genet. 36 (1): 40–5. Li QL, Kim HR, Kim WJ, et al. (2004). "Transcriptional silencing of the RUNX3 gene by CpG hypermethylation is associated with lung cancer". Biochem. Biophys. Res. Commun. 314 (1): 223–8. Xiao WH, Liu WW (2004). "Hemizygous deletion and hypermethylation of RUNX3 gene in hepatocellular carcinoma". 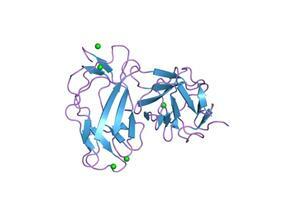 World J. Gastroenterol. 10 (3): 376–80. Oshimo Y, Oue N, Mitani Y, et al. (2004). "Frequent loss of RUNX3 expression by promoter hypermethylation in gastric carcinoma". Pathobiology 71 (3): 137–43. Jin YH, Jeon EJ, Li QL, et al. (2004). "Transforming growth factor-beta stimulates p300-dependent RUNX3 acetylation, which inhibits ubiquitination-mediated degradation". J. Biol. Chem. 279 (28): 29409–17. Ku JL, Kang SB, Shin YK, et al. (2004). "Promoter hypermethylation downregulates RUNX3 gene expression in colorectal cancer cell lines". 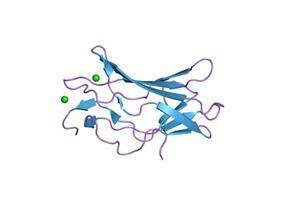 Oncogene 23 (40): 6736–42. Sakakura C, Hagiwara A, Miyagawa K, et al. (2005). "Frequent downregulation of the runt domain transcription factors RUNX1, RUNX3 and their cofactor CBFB in gastric cancer". Int. J. Cancer 113 (2): 221–8.